Brigid O’Donnell joined PSU’s Biological Sciences department in 2009 and is a developmental biologist. 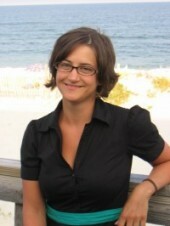 She approaches her work from an integrative standpoint – using techniques and perspectives that span the biological hierarchy: from modern genetic and molecular techniques to studies of organisms in their environment. Her current research focuses on the developmental biology of the large bodied and widespread mayfly, Hexagenia limbata. Her lab studies this species from both a morphological and molecular perspective and current work includes undergraduate-led projects on the genetic/molecular control of hatching time, variation in nymphal development, and characterization of nymphal densities and size distribution among different habitat types at local field sites. She advises M.S. graduate students in projects on movement and habitat choice of eastern brook trout in Coos County (RED Whitaker), population genetics of eastern spotted newts (J Vernon), and a comparative study of the attributes of native versus invasive species of Orconectes in northern New England (R Webster). ODonnell, BC and EL Jockusch. 2010. The expression of wingless and Engrailed in developing embryos of the mayfly, Ephoron leukon (Ephemeroptera: Polymitarcyidae). Development, Genes and Evolution. 220(1-2): 11-24. ODonnell, BC. 2009. Early nymphal development in Ephoron leukon (Ephemeroptera: Polymitarcyidae) with particular emphasis on mouthparts and abdominal gills. Annals of the Entomological Society of America 102(1): 128-136. ODonnell, BC and EL Jockusch. 2008. Phylogenetic relationships of leptophlebiid mayflies as inferred by histone-3 and 28S ribosomal DNA. Systematic Entomology. 33(4): 651-668.